This fresh blueberry banana almond milk smoothie is not only delicious but also paleo, gluten free, and dairy free! Years ago, I got this recipe from a close friend who made this smoothie every morning when our families were vacationing together in Florida. It was such a hit with my family that I’ve been making it ever since. 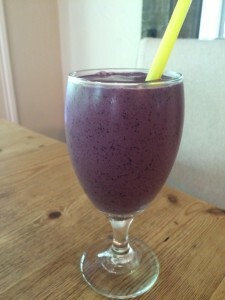 I prefer making this smoothie with fresh blueberries and frozen banana (I keep a bag in the freezer year round). I’ve tried other variations (frozen berries, fresh banana, etc…. ), and we prefer this one hands down. The smoothie gets sweetness from the banana, but I still add just a smidgen of my favorite stevia extract. Whey protein powder gives the smoothie some heft and your body some long lasting fuel. My favorite is Jay Robb vanilla whey protein. It is the best tasting protein powder that I’ve found thus far. Almond butter is tasty (and paleo), but we actually prefer the flavor of peanut butter in this smoothie. Try both to see which is your fave! I usually add a tablespoon or two of coconut oil to this smoothie. It has huge health benefits and adds a subtle coconut flavor. Chia seeds are also good in the smoothie, but you have to drink quickly. Chia seeds swell and make the drink gelatinous. I’d love to hear back from you if you try this! Comments on any of my posts are always welcome. Thanks so much for stopping by! Be blessed, and stay savvy!!! Fresh berries and frozen bananas make magic in a glass in this yummy, healthy smoothie. Place all ingredients in Vita-Mix or blender.